Jimmy is the hyper kid at the pinata party. 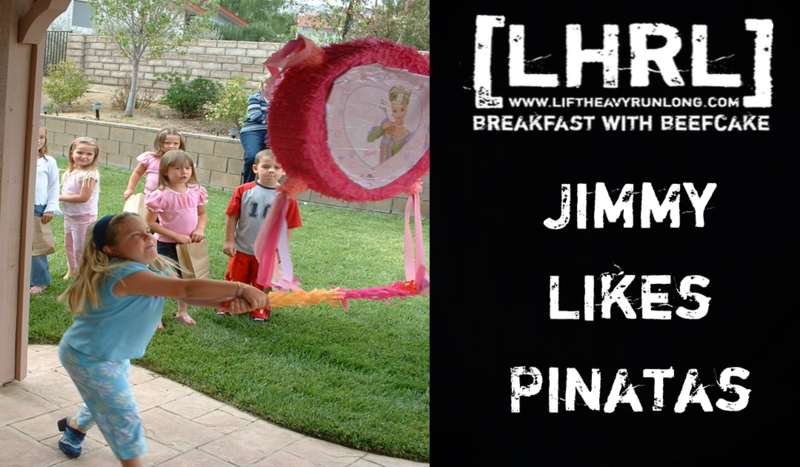 Jimmy loves pinatas, and he certainly loves to party. Jimmy watches the other kids and patiently awaits his turn to hold the stick. Jimmy wants his chance to crack that thing open. Jimmy can’t wait to embrace the blindness, as he takes a few swings at the mache (there’s supposed to be one of those thingies beside mache, but I don’t know how to do it) donkey which holds the mysterious treasure. Jimmy knows what’s about to happen. Jimmy knows that there is excitement ahead. Jimmy has to see what’s inside of that donkey. Jimmy knows that there is fun inside. Jimmy loves pinatas. The adults at the party cheer on the other children, as each kid cautiously takes a light swing at the swaying pinata. Every kid is hoping to make contact, but careful not to swing too hard. No one wants to swing and miss, or fall down in front of their peers. There is the risk of breaking something, and have someone be unhappy with you. We all want to be liked, and we all want approval. Jimmy is aware of this, but he needs to break the pinata. Jimmy knows that there is fun in his future. Jimmy loves pinatas. Every parent in attendance is watching Jimmy, as he slowly moves his way to the front of the line. The moms are digging through their purses, reaching for handfuls of Xanax and skillfully cupping them in the palms of their hands, while dispensing them to the other nervous moms, each with a wink and a nod. Steadily, in unison, as if performing the wave, sippy cups filled with “grape juice” begin being turned backwards with each step closer that Jimmy get to the pinata. Everyone in the room is a little nervous, because Jimmy’s turn is coming up. Jimmy swings the stick hard. Jimmy loves pinatas. As Jimmy makes his way to the front of the line, the rules are once again explained to him, in an effort to continue order. Jimmy listens politely, and waits for the blindfold and the stick. The rules will be respected, as will the hosts of the party, but Jimmy knows very well….in a room of stick-less people, the one holding the stick interprets the rules. As Jimmy takes possession of the stick, he does exactly as everyone anticipated. He takes a leaping step forward, and violently whiffs at the pinata. The other other kids become excited and yell, “Go left”, or “Swing right, Jimmy”. They love watching him go. The energy is contagious. Jimmy has no idea where he is in relation to the pinata. How could he? There is no road map, the art of the game is just to keep swinging. He continues to swing. He accidentally shatters the jar of lemonade, and swings so hard he falls on the floor. There is reason for embarrassment, but Jimmy has not the desire to feel embarrassed. There is a prize in the donkey, and he is going to see what’s inside. Jimmy must feel the satisfaction of splitting the pinata. He must know what is inside. There is curiosity to be quenched, a feeling achievement to be had, and sense of fulfillment to be attained. It is not so important the value of what is inside the pinata, but the mystery that is to be solved. Jimmy can guess and assume what is inside, but unless he sees for himself, there can be no sense of peace. There is fun inside that donkey, and there are new things to be seen. Jimmy will not pass up the opportunity to break this thing open. Jimmy is excited. Jimmy loves pinatas. Jimmy’s blindfold is uncertainty. The pinata is his life. His stick is his drive, his security, and his pride. Jimmy knows that there will be cake and ice cream. We are all given a certain amount of good, just by being here. We all get some cake, but Jimmy wants the excitement. He wants that “something more.” He is willing to risk the swings and misses, the stumbles and falls, the strange looks, the inevitable feelings of insecurity that are going to overtake him at some point during the game. Jimmy must break the pinata. There are wonderful, fascinating, and unknown things inside the pinata. Jimmy is going to find the fun. Jimmy loves pinatas. I know people like Jimmy. I want to be like Jimmy. I want to be the guy that wakes up each morning, puts on the blindfold, and just starts swinging. I want to be the guy who aggressively attacks the pinata every day, despite whiffs, falls, and ridicule. I want to be the guy that is curious and excited about what is about to break open. I want to carry my stick of confidence, and know that with it, I can break open the prize. I want to know what’s inside that pinata. Very day is a new pinata! Yes, it is! I just have to remember that.